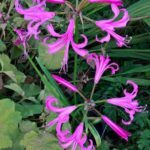 October’s plant of the month is Nerine bowdenii. Nerine bowdenii is a bulbous perennial growing to 50cm tall, with strap-shaped rich green leaves with erect stems bearing umbels of lily-like pink flowers 6-8cm in width. It comes from South Africa and likes a sheltered spot in full sun. It likes any well drained soil and any pH. Plant in early spring in a moderately fertile, well-drained soil. Protect in colder areas with a deep dry mulch over winter. It would look good in sheltered, sunny borders in city and courtyard gardens, cottage gardens, Mediterranean, coastal and gravel gardens.